The Labour party, relentlessly battered by an organized campaign of smears of its leader, Jeremy Corbyn – first for being anti-semitic, and now for honoring Palestinian terrorists – is reportedly about to adopt the four additional working “examples” of anti-semitism drafted by the International Holocaust Remembrance Alliance (IHRA). 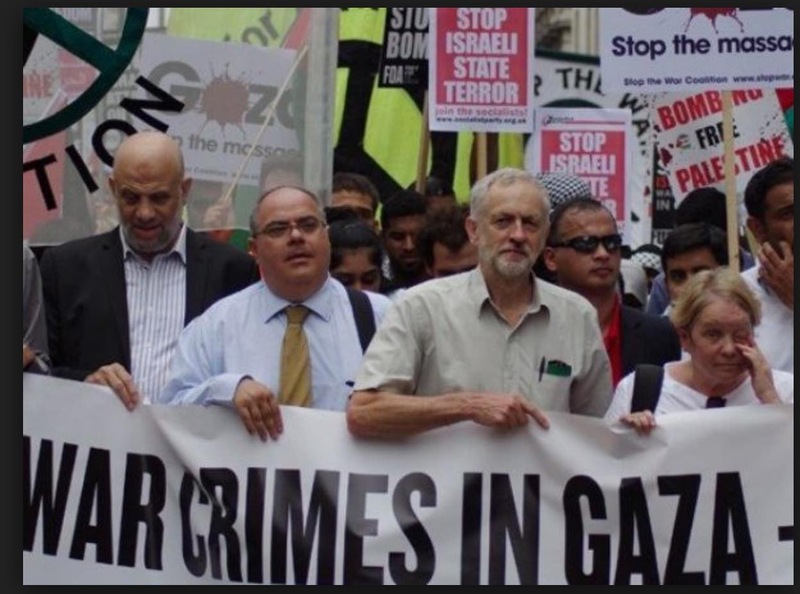 Labour initially rejected these examples – stoking yet more condemnation from Israel’s lobbyists and the British corporate media – because it justifiably feared, as have prominent legal experts, that accepting them would severely curb the freedom to criticise Israel. The media’s ever-more outlandish slurs against Corbyn and the Labour party’s imminent capitulation on the IHRA’s full definition of anti-semitism are not unrelated events. The former was designed to bring about the latter. According to a report in the Guardian this week, senior party figures are agitating for the rapid adoption of the full IHRA definition, ideally before the party conference next month, and say Corbyn has effectively surrendered to the pressure. An MP who supports Corbyn told the paper Corbyn would “just have to take one for the team”. The full adoption of the IHRA definition of anti-semitism will be a major victory both for Israel and its apologists in Britain, who have been seeking to silence all meaningful criticism of Israel, and for the British corporate media, which would dearly love to see the back of an old-school socialist Labour leader whose programme threatens to loosen the 40-year stranglehold of neoliberalism on British society. Besieged for four years, Corbyn’s allies in the Labour leadership have largely lost the stomach for battle, one that was never about substance or policy but about character assassination. As the stakes have been constantly upped by the media and the Blairite holdouts in the party bureaucracy, the inevitable has happened. Corbyn has been abandoned. Few respected politicians with career ambitions or a public profile want to risk being cast out into the wilderness, like Ken Livingstone, as an anti-semite. This is why the supposed anti-semitism “crisis” in a Corbyn-led Labour party has been so much more effective than berating him for his clothes or his patriotism. Natural selection – survival of the smear fittest for the job – meant that a weaponized anti-semitism would eventually identify Corbyn as its prime target and not just his supporters – especially after his unexpectedly strong showing at the polls in last year’s election. And as he has lost all sense of how to respond in good faith to allegations made in bad faith, he has begun committing the cardinal sin of sounding and looking evasive – just as those who deployed the anti-semitism charge hoped. It was his honesty, plain-speaking, and compassion that won him the leadership and the love of ordinary members. Unless he can regain the political and spiritual confidence that underpinned those qualities, he risks hemorrhaging support. But beyond Corbyn’s personal fate, the Labour party has now reached a critical juncture in its response to the smear campaign. In adopting the full IHRA definition, the party will jettison the principle of free speech and curtail critical debate about an entire country, Israel – as well as a key foreign policy issue for those concerned about the direction the Middle East is taking. Discussion of what kind of state Israel is, what its policy goals are, and whether they are compatible with a peace process are about to be taken off the table by Britain’s largest, supposedly progressive party. That thought spurred me to cast an eye over my back-catalogue of journalism. I have been based in Nazareth, in Israel’s Galilee, since 2001. In that time I have written – according to my website – more than 900 articles (plus another few hundred blog posts) on Israel, as well as three peer-reviewed books and a clutch of chapters in edited collections. That’s a lot of writing. Many more than a million words about Israel over nearly two decades. What shocked me, however, as I started to pore over these articles was that almost all of them – except for a handful dealing with internal Palestinian politics – would fall foul of at least one of these four additional IHRA examples Labour is about to adopt. After 17 years of writing about Israel, after winning a respected journalism prize for being “one of the reliable truth-tellers in the Middle East”, the Labour party is about to declare that I, and many others like me, are irredeemable anti-semites. Not that I am unused to such slurs. I am intimately familiar with a community of online stalkers who happily throw around the insults “Nazi” and “anti-semite” at anyone who doesn’t cheerlead the settlements of the Greater Israel project. But far more troubling is that this will be my designation not by bullying Israel partisans but by the official party of the British left. Of course, I will not be alone. Much of my journalism has been about documenting and reporting the careful work of scholars, human rights groups, lawyers, and civil society organizations – Palestinian, Israeli and international alike – that have charted the structural racism in Israel’s legal and administrative system, explaining often in exasperating detail its ethnocratic character and its apartheid policies. All of us are going to be effectively cast out, denied any chance to inform or contribute to the debates and policies of Britain’s only leftwing party with a credible shot at power. That is a shocking realization. The Labour party is about to slam the door shut in the faces of the Palestinian people, as well as progressive Jews and others who stand in solidarity with them. The article in the Guardian, the newspaper that has done more to damage Corbyn than any other (by undermining him from within his own camp), described the incorporation of the full IHRA anti-semitism definition into Labour’s code of conduct as a “compromise”, as though the betrayal of an oppressed people was something over which middle ground could be found. How these new examples will be misused by Corbyn’s opponents should already be clear. He made his most egregious mistake in the handling of the party’s supposed anti-semitism “crisis” precisely to avoid getting caught up in a violation of one of the IHRA examples Labour is about to adopt: comparing Israel to Nazi Germany. He apologized for attending an anti-racism event and distanced himself from a friend, the late Hajo Meyer, a Holocaust survivor and defender of Palestinian rights, who used his speech to compare Israel’s current treatment of Palestinians to early Nazi laws that vilified and oppressed Jews. It was a Judas-like act for which it is not necessary to berate Corbyn. He is doubtless already torturing himself over what he did. But that is the point: the adoption of the full IHRA definition will demand the constant vilification and rooting out of progressive and humane voices like Meyer’s. It will turn the Labour party into the modern equivalent of Senator Joe McCarthy’s House of Un-American Activities Committee. Labour activists will find themselves, like Corbyn, either outed or required to out others as supposed anti-semites. They will have to denounce reasonable criticisms of Israel and dissociate themselves from supporters of the Palestinian cause, even Holocaust survivors. The patent absurdity of Labour including this new anti-semitism “example” should be obvious the moment we consider that it will recast not only Meyer and other Holocaust survivors as anti-semites but leading Jewish intellectuals and scholars – even Israeli army generals. Is it not a paradox that were Golan a member of the Labour party, that statement – a rare moment of self-reflection by a senior Israeli figure – will soon justify his being vilified and hounded out of the Labour party? that Israel privileges the rights and status of Jews around the world, including those who have never even visited Israel, above the rights of the fifth of the country’s citizens who are non-Jews (the remnants of the native Palestinian population who survived the ethnic cleansing campaign of 1948). that Israel, as defined in the Basic Law, is not a state bounded by internationally recognized borders but rather the “Land of Israel” – a Biblical conception of Israel whose borders encompass the occupied Palestinian territories and parts of many neighboring states. How one might reasonably wonder, is such a state – defined this way in the Basic Law – a normal “democratic” state? How is it not structurally racist and inherently acquisitive of other people’s territory? Contrary to the demands of these two extra IHRA “examples”, the Basic Law alone shows that Israel is a “racist endeavor” and that we cannot judge it by the same standards we would a normal western-style democracy. Not least, it has a double “border” problem: it forces Jews everywhere to be included in its self-definition of the “nation”, whether they want to be or not; and it lays claim to the title deeds of other territories without any intention to confer on their non-Jewish inhabitants the rights it accords Jews. Demanding that we treat Israel as a normal western-style liberal democracy – as the IHRA full definition requires – makes as much sense as having demanded the same for apartheid, South Africa, back in the 1980s. That is where the anti-semitism “crisis” is leading Labour – precisely as it was designed to do.